'Double Shot' (George Sutton, R. 1999). Seedling H-51 M. TB, 36" (91 cm), Early to late bloom and rebloom. Standards white, sanded violet blue; style arms violet blue; falls white, heavily striped violet blue; beards white, hairs tipped yellow; slight sweet fragrance. 'Point In Time' X seedling G-83: ('Garden Grace' x 'Bountiful Harvest'). Sutton 2000. 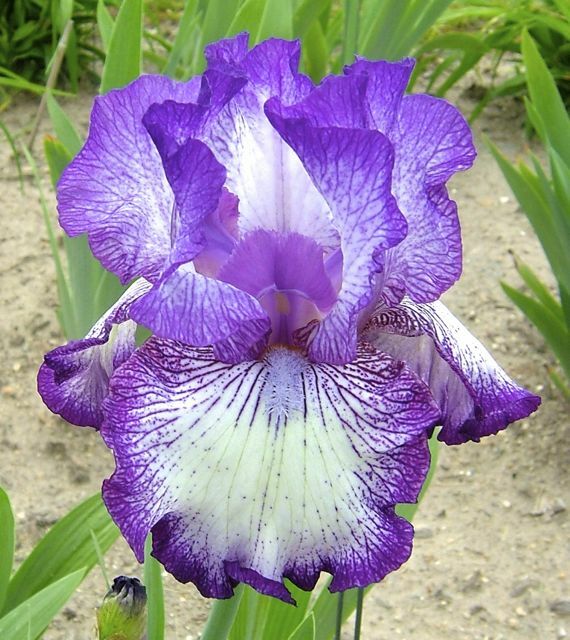 JPG DOUBLESHOT1.JPG manage 156 K 23 Nov 2018 - 01:20 Main.TLaurin Photo by Debbie Carpenter-Iris Splendor Garden-Australia. jpg Double_Shot3.jpg manage 59 K 15 Nov 2010 - 11:02 TasV 'Double Shot', Tasmania, Australia, 2010.